There are risks inherent in bringing in new vendors to your organization that must not be overlooked — “to forgo an onboarding process can expose the company to unnecessary risk." There are risks inherent in bringing in new vendors to your organization that must not be overlooked. There is a continuum of risk according to types and consequence of products or services. But even office supply vendors should be validated, as victims of printer-toner scams can attest. In the first point, he offers a common example of establishing a mandate that all new vendors above a certain monetary threshold require sign-off by procurement. Purchasing departments, sometimes with input from operations, finance and legal, will typically be responsible for developing the approval process. The second point is to have a checklist, particularly focused on risk, along with practical information gathering. Particular responsibilities for items on the list may belong to employees authorized to purchase, the purchasing department, the accounts payable department, or perhaps a master file group. Reviewing a new vendor against an easy-to-use list assures validation and compliance. Items on a checklist should include review of existing vendors to see if the company already has a vendor or vendors able to supply the needed product or service, and confirmation of the proposed new vendor’s capability. Other important items on the list are checks that the vendor is not owned or run by a politically sensitive person (PSP), and that the vendor is not on any national or international sanctioned list. Once the vendor has cleared these checks, other list items include obtaining tax classification and ID number; and such information needed to do business, such as contacts, remit to or bank account information, etc. And companies may include certain ethical or sustainability requirements on the checklist. The third point applies additional steps for strategic vendors and covers such things as contract compliance, service level agreements, etc. Once these are completed, the final step is addition of the vendor to the company’s approved vendor list, from which the purchasing department and other purchasers may then operate. VendorInfo supports companies in the second step, providing automated watch-list checks, customized vendor information forms, a tax-form wizard to guide vendors in providing the appropriate tax information form along with a tax-ID number (TIN) verification check against the IRS database. 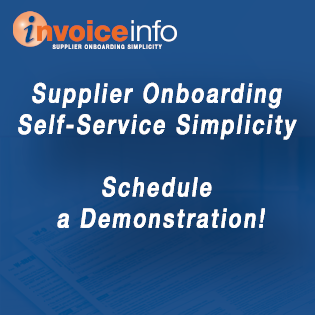 To see how VendorInfo’s onboarding solutions can benefit your operations and your company click here to request more information or call (678) 335-5735.